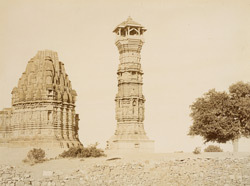 Photograph of the Kirthi Stambh or Tower of Fame from the 'Reading Collection: Views of Udaipur' taken by an unknown photographer c.1910. The photograph is part of an album containing architectural and topographical views of sites in Rajasthan, mainly of Udaipur, originally in the collection of Rufus Daniel Isaacs, Lord Reading, who served as Viceroy of India (1921-1926). Chittaurgarh, located 110 km east of Udaipur, is the location of the hilltop Chittaurgarh (Chitor) Fort, the site where Emperor Akbar (r. 1556-1605) attacked the Rajput rulers of Mewar in 1567. Chitor Fort is entered through the Padal Pol gateway and several key sites include the Palace of Rana Khumbha, Padmini's Palace, the Towers of Fame and Victory, as well as numerous temples. The Tower of Fame, pictured here, is a Jain monument dating from the 14th century and is approximately 24.5 m tall and is dedicated to the Jain teacher Adinatha.